Read the full thing after the jump. It’s been a while since I delved into the horror world, so this debut from Adam Vine seemed like the perfect place to start! Film student Drew Brady lives with his friends in a college house, where all the usual shenanigans associated with student life take place. His best friend/unrequited love, Bea lives close by and spends a lot of time there too. 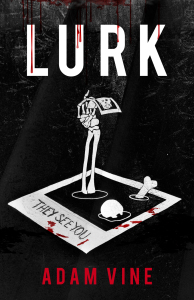 When Drew finds some polaroids of former tenants in the house’s suitably creepy basement, he soon finds that the photos reveal much more, and that a dark force is pushing the group towards something unimaginable.